Regalo Baby is one of the companies we have trusted since Kai's Birth. We have a Regalo Baby Gate for upstairs that is easy to use and super safe. Kai loves her Regalo Baby My Cot Sleeping Cot (see our glamping review here). Our family has been traveling all over Texas with the Regalo Baby Six Panel My Play Portable Play Yard. From road trips to hotel stays, this play pen has saved our sanity and kept Kai safe since she was a crawler. 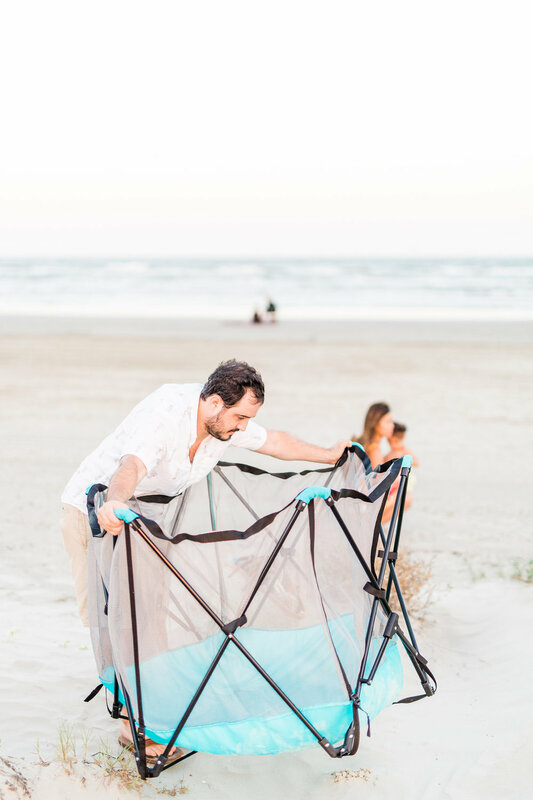 With summer in full swing here in Texas, I can't believe we haven't shared our favorite use for it yet - at the beach! I am rounding up 3 hacks to make your next beach trip with a baby a lot easier. I have learned along the way a little prep goes a long way, especially true when it comes to travel, no matter the distance. Tip 1: Keep your beach bag packed and ready to go! We cut down the prep time for every pool, beach, lake trip so much shorter by packing a bag ahead of time with all the essentials. WE use clear, splash proof cases so you can easily see the contents and cuts down on time spend digging through a beach bag. Things I like to keep stashed in the bag always are: sunscreen, swim diapers, wipes, extra change of clothes (just something small and really light), sunglasses. When you buckle floaties to the handle of the beach bag, it keeps everything together and organized. I recently bought 2 visors and velcro the hats to the handle of the bag too so we never forget sun protection. One of my favorite uses for the Regalo Baby Six Panel My Play Portable Play Yard is as a safe play pen at the beach! The Regalo Baby My Play is so light, we practically carry it everywhere. Kevin actually keeps it in the bed of his truck so it's always easily accessible. The My Play Portable Play Pen comes with a carrying case with a shoulder strap. Getting it down the beach is a breeze. To set up the play pen, it takes maybe 3 minutes. All you have to do is take it out the bag, unfold and lock the legs. I use it as a sand free zone for all the kids. When Kai was younger, she used to nap right in the Regalo Baby My Play. She recently developed a fear of the sand. She refuses to actually touch the sand with her feet. From what I hear, this is not uncommon with toddlers. When I get tired of carrying her, the My Play is one of the only places she will let me set her down because it's our sand free zone. It's also super handy for storing all your bags or times you do not want to get messed up a the beach. Seriously, this is not overkill, I promise. Little sandy toes and feet make their way back to the car and create absolute messes. If your child has a sensory sensitivity to sand like Kai, she or he will appreciate a rinse off. Plus, my husband and I actually love being able to clean off where ever we are too. Sometimes we have even ran out of drinking water so this really saves us! I hear somewhere that we only have 18 summers to spend with our kids. That really puts things in perspective for me. No matter the destination, it's all about the journey. I hope your journey this summer with your kids are full of fun memories!